Back in college, the zaftig music editor of the school paper used to sneer "Todd is God." She may have had something there, although I wish it wouldn't have come from her. Rundgren's life as a pop and rock music chameleon and jack of all trades never seems to get its proper due. He probably could have cruised for years cranking out surefire little pop ditties like "Hello It's Me" and "I Saw The Light." But then he'd make a complete left turn and do something nuts like his album Faithful, which was like his musical version of Gus Van Sant's shot-by-shot remake of "Psycho," except he did note for note copies of the Beach Boys "Good Vibrations" and The Beatles' "Rain." Or his 20-minute electronic drone excursion that occupied the entire second side of 1981's Healing. Let's not forget Todd the maniacal producer, who made commercial gold out of Grand Funk Railroad, Meat Loaf, Patti Smith, The Psychedelic Furs, Cheap Trick, The Tubes, XTC and others. That's a whole other blog entry. After wandering off the beaten track commercially for much of the 80's, Rundgren pulled another one of his outstanding pop gems out of a hat when he assembled a huge set of musicians and singers in the studio and cut the Nearly Human album live. 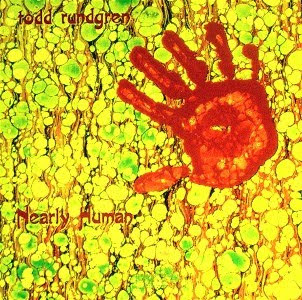 Always introspective, soulful and taking an unvarnished look at the human condition, Rundgren melded amazing hooks with his vocal arrangement mastery to tackle singular obsession ("The Want of a Nail"), child abuse ("Unloved Children") and the mind games between lovers (the exuberant "The Waiting Game"). The production was quite grand, rivaling the one on Bat Out of Hell, but certainly more impressive that it was all done live in studio. Unfortunately, the CD mastering was aggressively compressed, which flattens the dynamics of the many instruments and vocals used in the album. Coming in my final months at Radio City Music Hall, I finagled tickets to see Rundgren and the whole original band on his album tour stop at The Ritz venue. The place was packed, the Todd is God groupies were out, and they blew the roof off with a horn section, an extended group of musicians and background singers. However, one special song stands out from that record, from a forgotten theater project Rundgren that came and went when Nearly Human came out -- a musical version of playwright Joe Orton's never-used Beatles movie script "Up Against It." "Parallel Lines" is is a searing sad mid-tempo ballad about how certain relationships are never meant to happen, given a layered pop treatment on the album. I particular love the fact that each of the verses' last lines is completed in the choruses. From this classic personal project, Rundgren had no problems doing what may be called "crass sell out" gigs, something that almost seemed antithetical to his usual anti-corporate banter. Yes, he did the Ringo Starr & His All-Stars Tour, but even more fascinating was jumping into the Ric Ocasek role when some of the remaining Cars reunited to record and tour to cash in on New Wave nostalgia in 2007. I thought it was musical heresy when guitarist Elliot Easton and keyboardist Greg Hawkes hooked up with Rundgren to record a couple of Cars-clone songs and then tour as The New Cars. Rundgren recruited his old Utopia mates Kasim Sulton and Prairie Prince to join on what was an obvious way to pocket some easy cash. Original Cars bassist Benjamin Orr had passed away, and both drummer David Robinson and Ocasek wanted nothing to do with the deal. You have to admire Rundgren for taking some of that Faithful magic and writing a song that sounded remarkably like an Ocasek number and even produced like one, almost a loving parody. The drone-ish clipped vocals, sarcastic, obtuse lyrics -- all there. Below are two very different version of "Parallel Lines" -- the first is a stripped-down slow and moving rendition from the TV show "Night Music," followed by the tour band performing the album arrangement live in Japan. And then The New Cars, on "The Late Late Show With Craig Ferguson."